Looking to update your outdoor space? Shrubs make exquisite accents or focal points in your landscape design. It can be used as foundation plantings for many gardens , or even backdrops defining garden beds and adding interest to it. Make your walkway, pathway, staircase standout by bordering our beautiful Dwarf purple shrubs. Faux daffodils comes in cool colors and cool colors when used near the borders and fences, create an illusion of enlarged space. Faux purple daffodils greenery shrubs plants as picture show 4 Bunches , 7 stems .each bunch. Four bunches in package. Tip: Because of the faux plant is made with plastic, so there maybe will have some smell. Please put the plant placed in ventilated place for 1-2 days. When shipped, each bouquet are putting close in order to reduce space. Customers can adjust the branches to the most natural state. 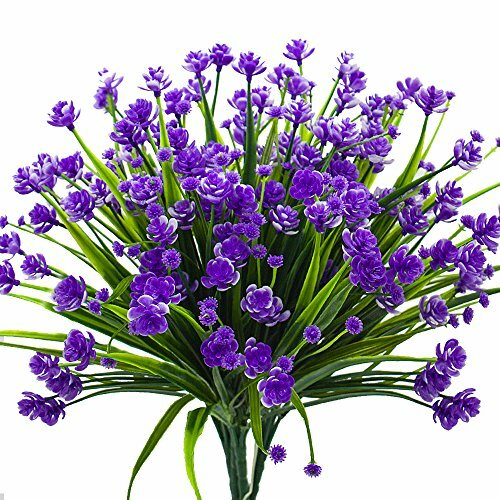 【The Ideal Home】: Gaze this lifelike faux exotic daffodils in sparkling bright purple color, amid lush green leaves,shining and twinkling , rest your mood and wonder. well made and vibrantly colored look realistic. 【Anywhere Flowers Decorate】: Enjoy a vacant time accompanying this fake daffodils in kitchen, windowsill,living room, dining table, bedroom, patio, forecourt, birthdays, Valentine's Day to fill your heart with pleasure. 【UV Resistant】: Plastic plants is uv resistant and never fade, Upscale look Artificial flowers are perfect for any landscaping project or decor style. This silk bushes will never die off and easy take care of it can against Fierce wind Rainstorm and insolation. 【Feature】: Fake outdoor flowers appr. 9.5" Wide x 13" length. Each bouquet has 7 flexible stems and bushy leaves. 【Family Happy Time】: You can invite friends and families enjoy the afternoon refreshments at the ideal home, with artificial fake flowers .create an illusion of enlarged space. If you have any questions about this product by Grunyia, contact us by completing and submitting the form below. If you are looking for a specif part number, please include it with your message.